Cheffois. Tel.02 51 69 68 76. 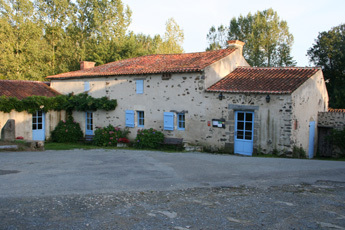 It is early September 2008 and Trevor and I have ventured into the Châtaigneraie area to check out the above Farm Restaurant set in an old cloth mill on the river’s edge in the middle of the Vendéen meadows, and surrounded by the owners’ farm. Both Trevor and I have eaten here independently before but it was some time ago and the Auberge had just won an award for the best farm auberge in the Vendee. This was quickly superseded by a national award, and Isabelle the very talented chef in the family business, Roland her husband runs the farm, wastes no time in telling you that everything she uses in her cuisine is produced on the farm. The dining room is old and charming, its dark wooden floors, antique furniture and magnificent fireplace give it a timeless feeling and I can imagine eating there with the fire lit on a winters evening would be a wonderful experience. 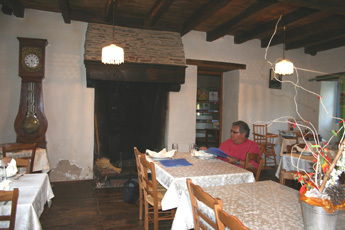 Even though it was a Tuesday night in early September we were not the only diners, and were soon joined in the dining room by a group of four other English people and a Belgium couple. Isabel, who like me the locals would describe as bavard (talkative), not only enthuses about her food, but also almost uniquely amongst the French, extols the virtues of English produce, which she has tasted enthusiastically at English evenings. She particularly likes English cheese so Sir Alan Sugar, eat your heart out. 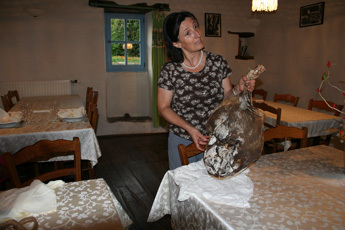 She also loves English diners who she thinks are possibly even more discerning and appreciative than the native French. I decided on this occasion not to have an aperitif and just drink the house red wine which was good and not at all expensive. Typically Trevor got lucky, as Isabelle didn’t have any alcohol free lager he had the home made apple juice instead and said it was as good as it gets. 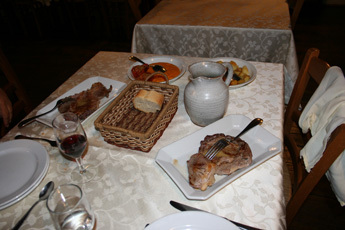 There were various menus starting at 18 euros, we both chose the 24 euro menu mainly because we fancied a steak from the farm reared charolais beef. After some debate as to whether I should “chomp the charcuterie” or “try the terrine”, I decided on the charcuterie (pork) entrée, while Trevor went for the smoked trout. Both the charcuterie and the terrine were home made and I am a sucker for a home made terrine de la campagne. 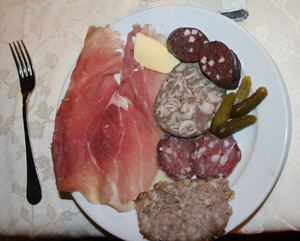 Isabelle came boldly to my aid and said she would put a slice of terrine on my plate of charcuterie, I was grateful as the charcuterie was fantastic, the boudin noir (black pudding) was amongst the best I’ve ever eaten, the smoked ham was also sublime and the terrine, although just a tad dry, was well on the good side of excellent. 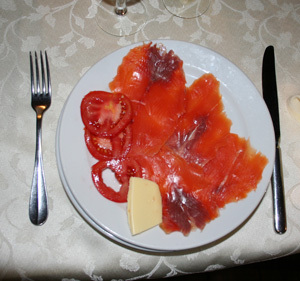 Trevor’s smoked trout was also absolutely superb; it had a very delicate taste, was not too salty and the texture was melt in your mouth, I know this for certain because good old Trevor gave me a taste of the trout before I started my charcuterie. We both had the entrecôte of charolais beef; it was served with sautéed potatoes and an orange mash which caused some discussion amongst all of the diners. 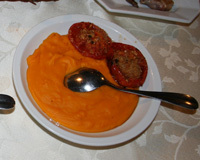 One of the other diners was a former chef and none of us could work out what the mash was, it was left to Isabelle to put us out of our misery and tell us that the mystery dish was in fact pureed pumpkin. It is the first time that I have personally eaten pumpkin and if it was always as delicious as this I would make it a staple of my diet, but I somehow doubt that I would find pumpkin as good as this very often. 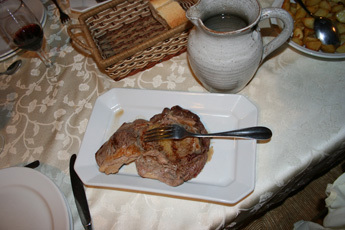 The beef was not only copious, but was of outstanding quality and was perfectly cooked. I can’t help thinking that a top quality cut of meat simply but perfectly cooked is hard to beat and is surely not beyond the compass of any restaurant, it is true to say that it is so unfortunate that quality like this is so rarely emulated. The choice of dessert wasn’t large but it was all home made. 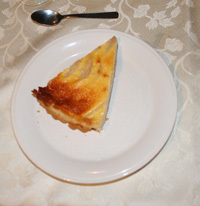 Trevor had tarte aux poivre (pear tart) and said that yet again it was as good as it gets. I decided on the chocolate fondant, and here I must say was the first very slight disappointment of the meal. 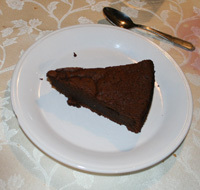 The principal quality of a chocolate fondant for me is rich chocolate sponge with a gooey liquid centre. This was in my eyes really a chocolate tart and not a fondant and to that end I felt let down, I wasn’t however dissatisfied with the taste, it was a very good chocolate tart. It was for me a little dry and would certainly have benefited from a spoonful of cream, clotted would have been terrific, crème D’Isgny would have been a fair second best, but neither would have turned this into a fondant in my eyes, or my mouth for that matter.